When we moved back to my home town last year, one of the hardest parts of leaving our old community was leaving our church. Having gone almost ten years of sporadic church attendance and almost zero sense of belonging, we had found a place to call home for almost five years. A real family. We were involved. We were eager. We were loved. Then we decided to move. A year after making the decision final by putting our house on the market, we are still 100% certain we made the right decision. Absolutely no regrets. But my heart still aches for my old church. Yesterday, we began the process of officially joining our new church. We visited a handful of congregations last summer when we moved, and we chose this one quite honestly because it was very similar to our old church. Eerily similar. I’ll spare you the list, but it’s safe to say we have a type when it comes to church. And not just because of denomination. This is some very specific stuff. We were attending regularly by September, because the kids love Sunday School, and I love church. I like hymns and organ music. I like good sermons and insightful scripture readings. I like the bell choir and the coffee between services. But I love church. Love it. I wasn’t ready to join officially last fall, because it felt too soon. Like cheating on old church. But this is a new year and I’m ready. 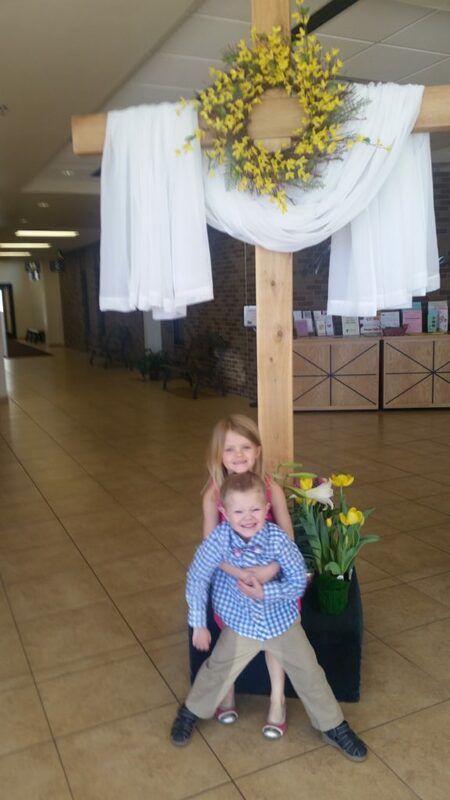 Our last Easter at our old church. Any excuse for an adorable picture of my kiddos. During new member class yesterday, my new pastor perfectly articulated why I love church so much: community. He explained how hard it is to do this Christian thing alone. Christianity, he said, is about your relationship with God and your relationship with God’s people. The end. I love the simplicity of that explanation. And I love what it can mean for people who don’t choose to attend church, or believe in God for that matter. My dad didn’t attend church. When I was a kid, I would ask him, “Dad, how come you don’t have to go to church?” (The fact that I “had” to go to church was one of the reasons I left that church right after confirmation. I didn’t love it.) And my dad replied, “Me and the Naz have an understanding.” Jesus of Nazareth. The Naz. My dad was sooooooooo cool, right? Anyway. “I don’t have to go to church, because the Naz knows how I feel. That’s enough.” My dad fought and suffered in Vietnam by draft order. It tortured him every day he was there and every day after until he died in 1996. I didn’t know that when I was 9 and trying to understand why he didn’t come to church with us, and I didn’t know that until after he was gone. Once I knew it, though, I understood completely. His relationship with God’s people was a little complicated. His community was elsewhere, but he had it. His relationship with the Naz was elsewhere, but it existed. I know he’ll greet me in heaven. A friend of mine asked me when we were in college, “Do you think I’m going to hell?” He was a proclaimed atheist, but the question alone makes me re-label him agnostic. “Why do you think I would think that?” Answer a question with a question. Probably I was in the middle of freshman psych. “I don’t know. I guess I wonder about that, if you’re judging me.” I asked him if he believed the world cared about him. If he cared about the world. He said yes. I said that’s enough of God for me. Plus, I don’t really believe in hell. God loves you. The world loves you. You love God’s people. You love the world. It’s just another way to say the same thing. We are slowly getting involved. We are just shy of eager. But I know we are already loved. Soon, I’ll stop calling it our new church. We will foster our relationship with the Naz in an awesome new community of people, who are so ready to welcome us. My new pastor also said in new member class, “Have a cookie. We like to eat and we like to sing.” So there’s that, too. Amen to cookies.